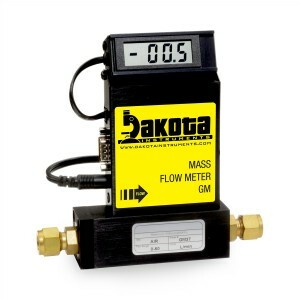 Using mass flow principles of operation, Dakota's mass flow products are unaffected by temperature and pressure variations within stated limitations. Metered gases are divided into two laminar flow paths, one through the primary flow conduit, and the other through a capillary sensor tubes. The flow conduits ensure laminar flows and therefore the ratio of flow rates is constant. 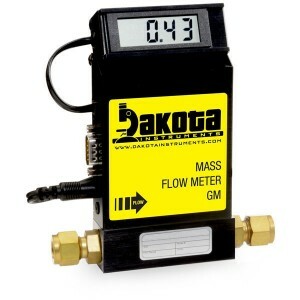 When flow takes places, gas carries heat from upstream to downstream of two precision temperature sensing windings. A Wheatstone bridge is used to monitor temperature dependent resistance gradients on the sensor windings which is linearly proportional to the instantaneous rate of flow. 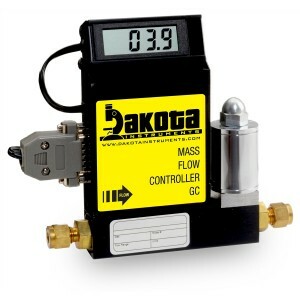 Dakota's Mass Flow Controllers are compact, self contained and easy to read. 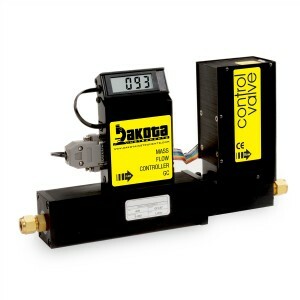 The rugged design and instrumentation grade accuracy provide versatile and economical means of flow control ideal in laboratory and industrial settings. The built-in electromagnetic valve allows the flow to be set to any desired flow rate within range of a particular model. Set points may be controlled either locally or remotely. 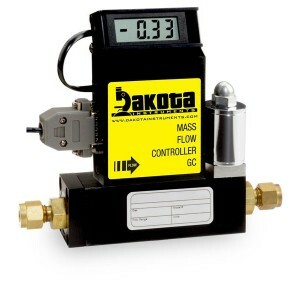 Available in flow ranges from 10 mL/min to 1000L/min relative to Nitrogen. Accuracy +/-1% full scale for models up to 100 Liters per minute.